Look at those rocks. These are nothing. You haven’t seen rocks until you’ve been to Moab and run 13.1 miles down Hwy 128. Moab is where rocks come from. As scenic as this course was though, the entire drive to Moab ain’t too shabby. The tunnels through Glenwood Canyon are pretty awesome. Dave and his two daughters drove with Karen, Ellie and me. We had lunch a little after noon in Vail and arrived in town around 5pm. We stopped less than we anticipated along the way, ironically, more for the adults needing rest stops than the kids. We hit the one liquor store in town before going to the condo. It was interesting; being a state run liquor store, they didn’t have coolers or sell ice. Needless to say, they didn’t have little brown paper bags for your single either. We arrived to a happening party at the condo with most of our friends already enjoying happy hour in the front yard. Not a bad start to the Moab Canyonlands Half Marathon. We ended the night at the Red Cliffs Lodge for dinner where both the service and food were as good as the view. I walked to the race start around 7 in the morning with Keith, Susan and Katherine. We stopped for coffee first at the Red Rock Bakery and Net Cafe. The owner was unbelievably personable – and the coffee was very good. Then we completed our walk to Swanny Park and boarded a bus for the race start up Hwy 128. The start of the run wasn’t until 10am, so we queued up for the port-a-potties and then found a nice spot up the canyon wall to sit on some rocks. 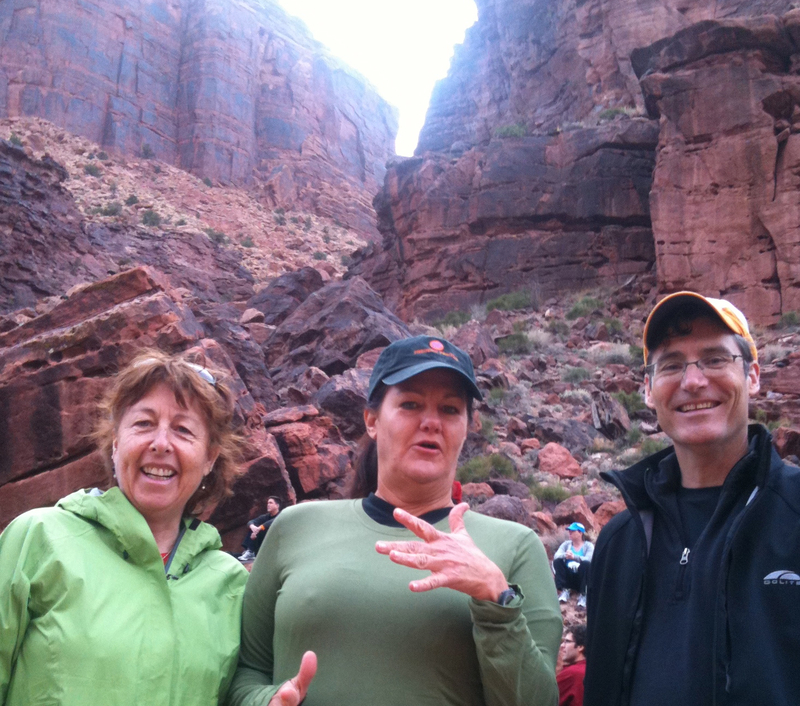 The picture above is of my running mates at this time – Katherine, Suzy and Keith. One of the professional race photographers came by later and took our picture after more of our group had joined us. The weather felt fairly pleasant at first and I was starting to feel like I might have over dressed and felt remiss for not bringing a short-sleeve shirt. I could have taken multiple shirts with me inside my gear bag, but I’d committed to my white Under Armour, long-sleeve compression jersey. I wore a red long-sleeve fleece top over that, along with gray fleece pants – both Under Armour as well. But my plan was to store those in my gear bag before running. Then the wind picked up noticeably and the clouds began to form overhead. I actually pulled my wind jacket out of my gear bag at that point to stay warm. We had another 60 minutes before the start of the race and we all began to re-assess our wardrobe selections. I did however start to feel more confident that I was good with long-sleeves. With 20 minutes left, we were allowed to walk the remaining half mile from our bus drop off area to the start up the hill. We had to commit to our dress gear on that walk as the gear bag trucks were positioned before the starting line. Upon reaching the starting corrals, the wind began to howl. So many runners, in short shorts and tank tops were shivering. The situation seemed almost dire and I considered whom I might spoon with for warmth. No options presented themselves but I did start up a conversation with Allison, a charming lady from the Springs. She noticed my Barr Camp running hat and asked if I’d run the Pike’s Peak Ascent. I haven’t, but I did hike Pike’s Peak and stay at Barr Camp. I ran the first half mile or so with her and she read out our pace from her Garmin. I found this helpful as my goal was to try my best to run no faster than a 9 minute pace for the first mile or two. I think I hit this although it might have been more due to starting at the 9 minute mile pace sign and the road being so narrow that it took several miles before there was sufficient room to run my own pace. The shivering subsided immediately upon running. It was never so cold that my ears were numb, but the wind was super strong. After two miles though, I was feeling pretty warm. I even rolled up my sleeves by mile six. Compression shirts are tricky though. I found it uncomfortable for my sleeves to be rolled up past my elbows and had to roll them down below my elbows where they didn’t feel tight. I felt really comfortable at this point and even though I didn’t have any confirmation of my pace, I felt certain I was running around an 8.5 minute mile. I didn’t wear ear buds for this race. Not sure why I made that decision but once running I definitely appreciated the heightened visual of one of the world’s most spectacular roads without the distraction of audio. Something I wouldn’t have noticed listening to audio was whenever the wind roared up around a bend, its effect rippled across a hundred race bibs leading me to imagine I was flying with a flock of birds. That probably sounds weird but the sound must have triggered something in my subconscious. The wind wasn’t at all constant. It was dead still at times, like around two miles when I felt hot; but after some bends the canyon would inhale into my face and chest while it exhaled against my back around other bends – all seemingly random. The course never dropped more than 100 feet over the entire length, but it felt downhill forever. A pace changer of a hill presented itself at mile 9 but gave back all its altitude on the far side. Mile 11 began the climb back out of this gorgeous canyon hole. It was never steep, and hardly even noticeable, but it was enough to keep me from increasing my pace as I neared the finish. I kept my pace steady to the end and was really happy to discover I’d finished the 13 miles with an 8.12 pace. Even more pleasing was that after my lessons learned from the Austin Marathon, I effectively controlled my pace and remained comfortable the entire run. I’m really excited to think I’m learning my pace. I finished with my family cheering me on, took the official race photo, and proceeded to claim my gear bag and change into dry clothes. I returned to watch my friends finish, although not fast enough to see Keith come in. Everyone did well, although I’m still so impressed that so many of my neighbors can run a half marathon period, let alone well. We attribute this to Coach Jabe, who has been leading Team Prospect in fitness for well over a year now with the result being our accomplishment today. I got to see Amy’s strong finish; and took another round of photos with her, Steve and Jen. Then it was lunch with Karen and Ellie, back to the condo for beer, hot tub, beer, prepping ceviche – and finally to a post race dinner of pulled pork with the gang. I’m now calorie neutral for the day, if not a little heavier after all that eating and headed to bed. Next weekend is the Boulder Half Marathon. Very nicely done race & recap. Bravo! You’d like this one Alohawk, You could camp out near the race start. I am very familiar with that scenic drive. Did you see the awesome spires of Fisher Towers? There is a nice hike up in there. Not sure if I saw them – no one pointed them out to me. I saw a picture of them later.